And that’s it folks! The Oscars are over and done with, awards have been presented and Jennifer Lawrence tripped again. Now we have maybe two or three weeks before the inevitable buzz starts around 2014’s crop of prestige films. The ceremony itself was significantly better this year than in many years past, not just for the entertainment the telecast provided but the recipients of the awards (I only missed 3 in my predictions). So here are some final thoughts on Hollywood’s biggest night before we start this all over again next year. Director Steve McQueen may have jumped for joy but I was breathing a sigh of relief when Will Smith said “12 Years a Slave.” Last night the most deserving film actually won, both when it comes to cinematic quality, and “importance.” But that’s not to say that Gravity, a stunning achievement, didn’t deserve its seven awards, including Alfonso Cuaron’s historic win as the first Latino to ever take the Best Director prize. McQueen made history too, becoming the first black man to actually take home one of the Best Picture trophies (given to the producers of the winning film). It was actually a good night (at least, by the Academy’s standards) for diversity, with Lupita Nyong’o taking Best Supporting Actress, John Ridley taking Adapted Screenplay and Mexican-born Emmanuel Lubezki taking Cinematography for Gravity. The big win was, of course, 12 Years‘ big win. One can only hope that in future years, the Academy will start picking the right movies when it comes to LGBT stories, too. It turns out Ellen was the perfect Oscar host. Safe enough that when she was announced, the focus was on how she would be the anti-Seth MacFarlane, not ruffle any feathers, and not turn the show into a sexist rampage. Leading up to the show, there was some murmuring about how, with such a broad choice as Ellen, the show could end up a little ho hum and boring, like her 2007 outing. That turned out to be definitively wrong. Apparently nice Ellen took a vacation and brutal Ellen took her place. Her monologue had zing after zing, going after everyone in the audience from June Squib to Liza Minelli to the general white guilt of the audience. (“Possibility number one: 12 Years a Slave wins Best Picture. Possibility number two: You’re all racists.”) The Academy got its daring, edgy comedy, but it came in a package much easier for audience (in the room and at home) to swallow, for after she was done poking fun at movie stars she ordered them pizza and took a record-breaking selfie. She wasn’t necessarily my favorite host but she certainly got the job done in a way that it hasn’t for awhile. 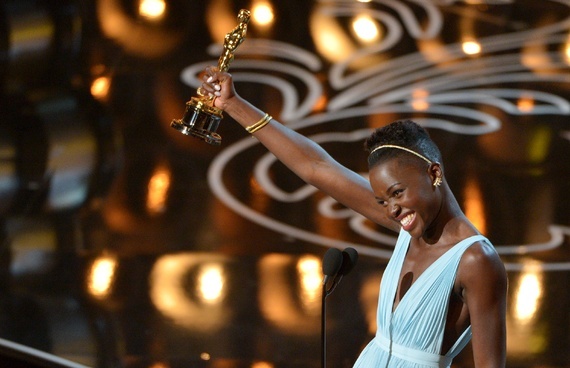 If last night belonged to anyone, it was Nyong’o, who took home Best Supporting Actress for her very first film role, dazzled us with her dress and her speech, gave Ellen lip gloss instead of money, danced with Pharrell and was all around the best part of the Oscars. Also she brought her endlessly entertaining brother, who you’ll remember forever since he’s in the most retweeted selfie of all time. May Lupita long be attending the ceremonies and making them better for us all. Of course no Oscar ceremony is complete without its share of slipups and odd moments, it being live television and all. Some unscripted moments were nice, like when Bill Murray gave a quick shout out to the late Harold Ramis. Some were less than nice, like when John Travolta garbled Idina Menzel’s name when introducing her performance of “Let it Go.” The internet is not very forgiving, John. Speaking of “Let it Go,” co-writer Robert Lopez is now a member of the EGOT club (Tracy Jordan would be so proud). Lopez and his wife Kristen Anderson-Lopez also win for most exciting speech, delivered in alternating verse and featuring a snippet of Happy Birthday. The Lopezes’ speech was short and sweet, so it made it all the way to the end before the orchestra started to play them off, but unless you are a Matthew McConaughey-sized star, you better be sure that you stay under the time limit. Here’s an idea for how to cut back on time, stop with the montages! Jim Carrey spent five minutes introducing a clip reel of “animated heroes” for goodness sakes. Everyone complains about the length of the ceremony, but clearly ABC wants the commercials all the way through midnight. So instead of padding the telecast with pointless montages around an arbitrary/shameless marketing theme (wasn’t it handy that Captain America himself was around to introduce one, when his sequel is coming out in May? ), it would be nice to let below-the-line winners get their due.